Home Campus Central Fire in University Stadium: How Safe are our Colleges? A fire broke out on Friday night in the building in University Stadium. The cause of the fire has been reported to be a short circuit. No casualties have been reported as the situation was brought under control soon. The building near the sports ground of University Stadium caught fire last night. The incident occurred in the building which has various offices. The alleged cause of the fire has been reported to be a short circuit. However, the situation was soon brought under control as the fire brigades reached in time and thus the fire could be stopped from spreading to nearby places. No casualties have been reported so far. The University Stadium is situated in the North Campus, just next to the Delhi School of Journalism. The fire was under control and thus Delhi School of Journalism, housed in the University Stadium is safe. The walls of the gallery in the building were noticed to have turned black with pungent fumes all around. A video of the same has been circulated by a student of Delhi School of Journalism in which a few firefighters can be seen on the site. Police were also present on the location but no statements could be taken from them. Fire is also one of the most common safety hazards, the reason behind which in most cases is found out to be short circuits caused by faulty or loose wires. 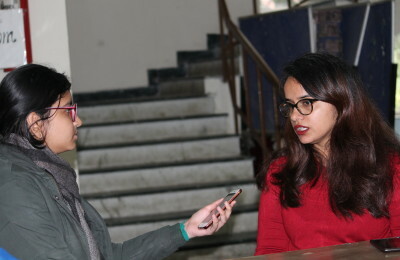 Fire incidents in the university campus have become more common as a few months back, a fire broke out in the chemistry block of Hansraj College which was also allegedly caused by a short circuit. Thus, this is the second fire incident in three months in the university campus. Luckily both the incidents were not very major and thus were controlled on time because of the presence of mind of the people present on the accident location. The fact that the fire brigades did not cause any delay in reaching the accident spot was also the main reason that the situation could be brought under control and the fire could be stopped from spreading to nearby locations. However, not many people have any information about the incident as colleges are shut because of mid-semester break and others who are aware of the happenings have declined to give any details.